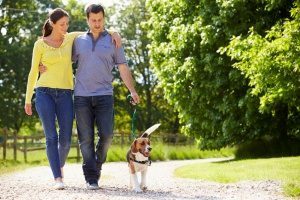 Walking your dog around the neighborhood every day or taking the same dog trails all the time can get extremely boring. 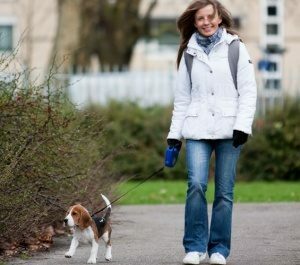 You don’t want walking your dog to be a boring experience! By choosing to go on a trail, you’re ensuring that both you and your dog will have a great and new experience. Find a Northern Virginia trail that you thoroughly enjoy enough to keep going back to regularly, or if you’re curious about all the different dog trails that Northern Virginia has to offer, try them all to keep your walks new and exciting. Paw Pals has created a list of the best dog trails to take your dog for a nice long walk in Northern Virginia. Each one offers scenery both you and your dog will enjoy! Bull Run Park located in Centreville, has a natural surface path that you can walk your dog on. It’s about 3.4 miles to complete the trail there-and-back, so your dog will surely get some great exercise. Your dog will love the woods, creeks, and the other wildlife that is out there. It also hosts many historic sights that will entertain you as you spend quality time with your dog. Bull Run is flourishing in the spring with trees and other greenery, and it’s absolutely breathtaking in the fall when the leaves change! You and your dog will fall in love with this trail and want to go back time and time again. Scott’s Run in Mclean has 300-plus acres containing dog-friendly trails. Many areas of the trail are covered by the leaves of tall trees so you don’t have to worry about the sun beating down on you. The trees create a beautiful ambiance that will make you want to stay there all day. The path is also a natural surface trail that your dog will love walking on. It’s part of the Potomac Gorge which is one of the rarest biological ecosystems in the mid-Atlantic offering plenty of new sights and creatures for your dog to explore. Scott’s Run also hugs a river and has many creeks that flow through the park, giving you a calming sense of ease and comfort. This is also great if your dog loves the water because they have the opportunity to splash around as much as they like! There’s so much to discover at Scott’s Run that one day there is simply not enough. Hemlock Overlook Regional Park is just outside of Clifton. It has a great trail that is easy to find, well-maintained, and has striking scenery. The trail is a relatively easy walk, but it presents just enough of a challenge to keep things interesting. It has plenty of woods, creeks, and wildlife for both you and your dog to enjoy as you follow the trail. Hemlock Park truly gives you the feeling of being in the woods and all of the wonderful sights and smells that it provides. Hemlock Park isn’t known to be super busy, so if you’re looking for a quiet place to walk your dog, this just may be it. Burke Lake Park offers the beautiful scenery of Burke Lake that you can view as you follow the trail with your dog. This is also a campsite, so many people come here to enjoy the activities on the lake or have a picnic in the park. It can sometimes get crowded, but if you’re looking to meet others or have other dogs for your dog to play with, this is the place to go! Burke Lake Park is a lively environment that truly captures the beauty of Virginia with its woods, wildlife, and lake. Burke Lake Park is also a great place to take your family! If you’re looking for a site that offers more than just a great place to walk your dog, this is it! You’ll find this park has something to offer everyone – especially your dog! If your dog loves to swim, this is a great place to take them as the lake is easy to access and is calm enough for them to play around in. Great Falls Park is a wonderful place to walk your dog. It’s an attraction that brings people from all over to view the falls, so you know you’re looking at something really special. While in Great Falls Park, you just have to be careful that you walk along the right trail since there is one specific trail that does not permit dogs. The park trails are some of the best in Northern Virginia, so it’s easy to lose yourself in its beauty. The wonderful sounds of the waterfall will surround you and your dog as you walk further along the trail and who would want to pass up this kind of opportunity on a Northern Virginia trail? The views of Great Falls Park are breathtaking; a true wonder of Northern Virginia. Many people routinely visit Great Falls Park for its unique beauty and a fun natural atmosphere. Why not explore this great site with the companionship of your dog? Fountainhead Regional Park is a great place for walking your dog because it has separate dog trails. There is a specific trail for walking and another one for biking, so you won’t have to worry about bikers as you’re enjoying the ambiance of the park. The park is very well kept so you are truly able to enjoy your experience. Fountainhead Regional Park is not as frequented as other dog trails, so if you’re looking to avoid crowds and potentially find some solitude, this is the place to go. This is great if you are looking to let your dog lead you on an exploration of the park since you won’t have to worry about crowds or other people. Your dog will love the long walk you take them on in this park, the experience simply cannot be beaten.